“From 6,700 style consultations I have learnt a bucket load about personal style. So many people kept asking me to write a book, well it only took me 4 years! It was a true labour of love as I do love what I do. Now it’s finally a reality and it’s jam packed full of simple down to earth tips that will help make your style journey an easy and successful one”. Written in a down-to-earth, straight-talking way, the self-help book “You Are More Than Just Your Bits!” will inspire confidence and motivate you to develop a style that excites and inspires you to get dressed each morning. Unlike any other book on style, this one moves beyond the hard and fast rules on fashion to address issues that we all struggle with every day, including the way we look, dress, and ultimately feel, in a way that could be life-changing. Appealing to the broadest of audiences, Cindy has looked through her professional and personal archives to deliver over a decade of style expertise, intricacies of body shape, clever shopping strategies, and customisable fashion guidelines. 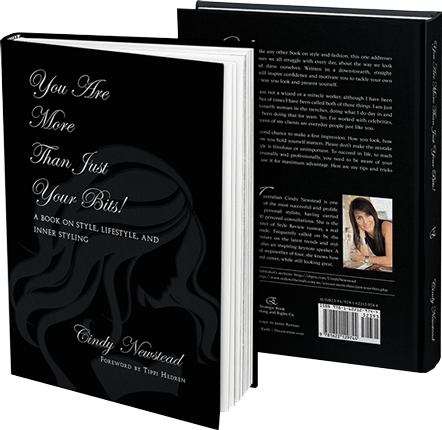 Says the author, personal stylist Cindy Newstead. “In this book, I want to change the way you feel about yourself. I want you to look beyond your imperfections, challenge any self-limiting beliefs you may have, and know that style truly comes from within.” She adds, “You will learn that you are not the only one who has style challenges and you will discover how to invest in creating your best self. You’ll also get coveted fashion techniques, tips, and tricks.” With a foreword by actress Tippi Hedren, prepare to be inspired, as this is indeed a very special book! Australian Cindy Newstead is one of the most successful and prolific personal stylists, having carried out well over 6,700 personal consultations. With over 15 years experience, her coveted industry knowledge keeps her in high demand. Her impeccable skills as a stylist are enhanced by her qualifications as a certified colour consultant, an NLP master practitioner, and an educator and facilitator of Australia’s finest and most respected styling academy. A mother of four and stepmother of four, she knows how to juggle family and career, while still looking great. It is this foundation that has inspired her to write her first book appealing to the broadest of audiences on uncovering your personal style.